Find out an Easter Egg no one noticed in "Spider-Man: Homecoming" about "The Prowler". The movie "Spider-Man: Homecoming" is a blockbuster movie and has been seen by millions around the world. Lists of hidden references abound and are a lot of fun. But there's one that everyone missed. I only noticed it the last time I watched the movie a few days ago. 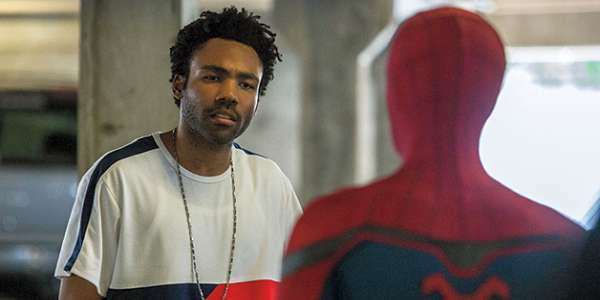 The scene where Peter sees a weapons deal under a bridge introduces Donald Glover's character. He plays Aaron Davis and is looking to buy some black market weapons. In the comics, Aaron Davis is Miles Morales' uncle. In the Ultimate universe, Morales takes over as Spider-Man. So that's cool and a lot of people picked up on that. But there's an even bigger clue to the character's future. In one part (1:06), Jackson Brice says they have a variety of hi-tech weapons for sale. This includes "black hole grenades, Chitauri railguns", and "antigrav climbers". The only thing Davis is interested in is the "climbers". Why? 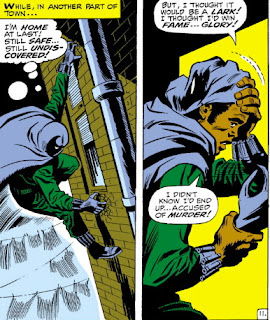 Prowler first appeared in the comics back in The Amazing Spider-Man #78 (1969) by Stan Lee and John Buscema. Hobie Brown is a smart and angry teenage African-American who is a whiz at engineering. He's a cat burglar named Hobie Brown with a hi-tech suit that lets him climb walls. Brown is actually Marvel's first black super-villain. Prowler later becomes a hero. Hobie uses his technical skills to build a costume. It has a number of unique devices like a cape that he can use to fly and boots with shock absorbers so he can survive high falls. But one of his signature devices is a set of steel tipped gloves he uses to scale walls. In the alternate Marvel "Ultimate" universe Aaron Davis later becomes the criminal and burglar known as "the Prowler" thanks to some tech stolen from Osborn. He first appears in Ultimate Comics Spider-Man #1 (2011). The interest Aaron Davis has in the "climbers" shows that he's interested in anything that can let him climb buildings and steal. So that seemingly innocent line "Yo. Climbers?" has huge meaning for his character. In the comics, Aaron Davis steals his equipment from The Tinkerer. Is this a clue to how Davis gets his equipment? While Donald Glover's performance as Aaron Davis was pretty funny the comic book version of Aaron Davis is ruthless. Glover hasn't played a villain before and it would be interesting to see if he could pull off the role. So the next time you watch the movie keep a look out for the huge Prowler reference and let's hope Donald Glover has a Marvel deal to bring the character to the screen. What do you think of the Easter Egg? Would you like to see Donald Glover play The Prowler? Avengers 4: Who is Gwyneth Paltrow's Rescue?